In recent weeks, a new worm hit the headlines. Called Stuxnet, it received major press because not only was it engineered to attack specific process control systems, but it also may have been targeted at a certain country’s nuclear program. But what caught my eye was the method of infection. This 1.5Mb monster (large and sophisticated by anyone’s standards) has the ability to leap from computer to USB flash drive and back, which is one of its main methods of spreading. With the proliferation of Flash drives these days, malware writers see them as an ideal medium for transporting their nasty little viruses and trojans from computer to computer – and noticeably from often poorly-protected home computers, past all of those expense corporate firewalls and anti-virus gateways, straight to the USB port of your office PC. The situation is not helped by our friends at Microsoft, who engineered a very convenient system in Windows which by default allows programs to be run from your USB drive when it is plugged in, without your knowledge or permission. So in this column, I’m going to show you how you can do a couple of things to prevent getting a virus from an infected USB – and how to stop your USB drives getting infected in the first place. Microsoft created the Autorun function to make life easy for us. They decided that we weren’t smart enough to find the Setup program on a software CD, so they gave software vendors the ability to create a simple file called “Autorun. inf” on CDs (of which USB drives are really just a sophisticated derivative). When you pop your CD or USB drive into the PC, Windows reads it, looks for an autorun.inf and, on finding it, executes all of the commands in it. If they happen to be “install this virus and steal all passwords”, that is exactly what it will do. First it disables the Autorun function on your PC, thus preventing the automatic execution of USB or CD-borne programs. Of course you can still open the drive in Windows Explorer and run programs if you must, but you’re probably plugging the drive in to copy some photos or music, right? Secondly, it uses a clever little exploit to “vaccinate” the Autorun.inf file on each drive, preventing it from working. So not only does this neuter any malicious program that might be lurking there, but it also stops future infections from installing themselves in this manner. I can’t really see a downside to this unless you are a marketing company and want to give people USB drives or CDs that open right up into your company’s presentations. But even then, I have little sympathy for you, so don’t expect me to shed any tears. There are possibly other USB “appliances” which may get crippled by being vaccinated (Checkpoint’s Abra springs to mind), but if you aren’t using such things (and I doubt you are, or you wouldn’t need to read this) then there is nothing to worry about. If you don’t like the Panda version, there is another freeware utility called Autorun Protector, which does much the same job (although it requires .NET Framework 2.0 or higher to work). Panda USB Vaccine works fine on all versions of Windows; I can’t say that I have tested Autorun Protector, but I assume it will work fine on Windows XP. Recently I read where someone bemoaned the lack of culture in Chiang Mai which is rather surprising given the large number of gallery openings, musical events and more that take place in Chiang Mai. From the interactive multi-media Madifesto exhibition at CMU Art Center that was held for two days in early October, to the current exhibition running there now, to the exhibition of pen and ink drawings of Chiang Mai temples and architecture by the talented Thai artist Tanachai Ekuruchaitep and miniatures paintings by Gilbert Medam at Sangdee Gallery (until November 9) to the photo exhibition at Soho on Huay Kaew. Then there is the marvelous Myanmar art show reviewed in another piece, there is certainly no shortage of art on show in Chiang Mai. Pen and ink drawings and miniatures are on display at Sangdee Gallery on Sirimangkalajarn Soi 5. Pictured here are the artists, Tanachai Ekuruchaitep and Gilber Medam. If one were to move on to music, the Guitarman recently played host to an amazing cumbia band from Mexico, La Sabrosa Sabrosura put on an excellent show with their funky beats, a unique Mexican blend of the Colombian style Cumbia music mixed with reggae and ska. Those that weren’t already up and dancing were bopping in their seats. Additionally the Isaan fusion jazz band Boonhugsa plays both at Sangdee Gallery and at the Garden and renowned Thai singer Nadda Viyakarn performed at the Playhouse Theater on October 12. What lacks in many of these events is sufficient advance notice! So, to all galleries, musicians and more, please feel free to let us know when you have something coming up. We are happy to include it in our every growing community happenings page that will be updated online regularly and on facebook. Madifesto, at the CMU Art Center recently, featured multimedia interactive exhibitions including this unique mock up of a full body scanner from the airport, more than a few visitors to the gallery were wary of walking through and it demonstrated in a very visible way, the artists concerns over personal privacy. 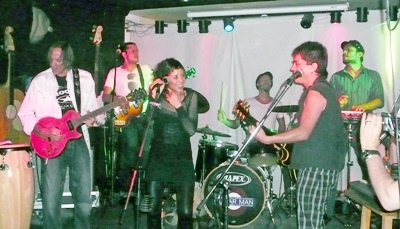 and funky music at the Guitarman on October 8 and 9. A spectacular and comprehensive collection of new works from 25 of Burma’s leading artists is on display at the CMU main art gallery onNimmenhaemin Road. This is one of the most important exhibitions to open in Chiang Mai in recent years. Some of the artists attended the opening on Saturday October 9, from their homes in Burma (a.k.a.Myanmar) and the wide range of work on display – around 80 paintings – was an impressive indication that whatever the internal political problems of the country, contemporary art is certainly flourishing. 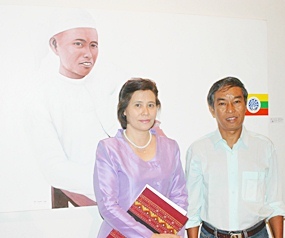 The exhibition was mounted to help celebrate the sixth anniversary of the Suvannabhumi Art Gallery which is based at 116-118 Chareonrat Road. The owner of the gallery, Khun Mar Mar, has been promoting Burmese art for many years and brings over works on a regular basis. The sheer size of this show would be one indication of the vibrancy of art in Burma, but what makes it notable is the range of paintings on display – from abstract to semi representational, from water colours to acrylic and oils. Most of the painters are well established in their own country and still live there, although a few have moved abroad. Many are achieving international recognition. Most are working and often teaching in Yangon. Everyone will have their favourites in such a colourful and exciting show, for me they included the vividly coloired abstract works of Kin Maung Yin, the wonderfully inventive paintings of Po Po, the highly atmospheric work of Kyee Myintt and the evocative and beautifully textured paintings of Pe Nyunt Way. But all of the artists, young or venerable, deserve your time. 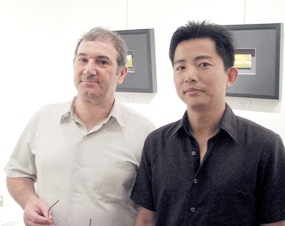 The ‘Myanmar Contemporary Art Exhibition’ is open every day (except Mondays) until 30 October, 2010. 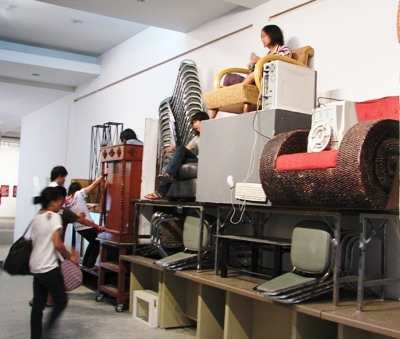 Located at the Chiang Mai University Art Centre, with free entry.